Home » Tucker Toons' booth » "Everybody wears A Mask!" 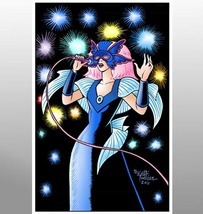 A Jem and the Holograms-Sketch Print"
"Everybody wears A Mask!" 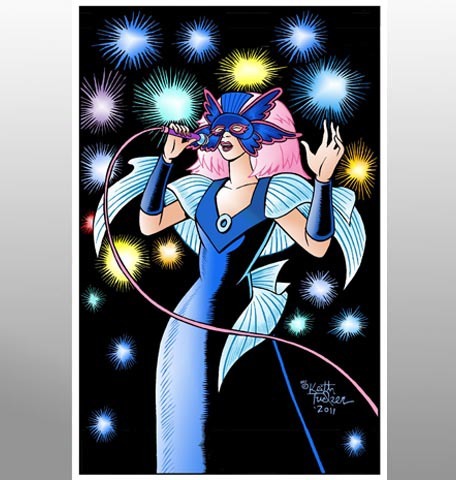 A Jem and the Holograms-Sketch Print"
11x 17 art print printed on heavy cardstock paper, shipped flat reinforced cardboard in clear plastic sleeve with backing board and signed by the artist ( me ). Way back in the 80's I drew song sequence storyboards for the animated show " Jem and the Holograms" . This sketch is a recreation of one of my panels, from the song sequence I story boarded, "Everybody wears A Mask!" that I painted in Photo shop recently.